QUORUM is a play about a bunch of people, fumbling around in an attempt to organize themselves into a group of people. They struggle with the basics of democracy: voting, equality, and fairness, and always go away with a hint of promise to maybe try again tomorrow. The seven characters are clown-like, in a way, and the play is full of humor. QUORUM had three primary sources of influence and inspiration: monkeys, politics, and Robert’s Rules of Order. I believe my initial inspiration was the social behavior of monkeys, explained to me by a television documentary I watched several times, plus research visits to “Monkey Island” at the Milwaukee County Zoo. (In fact, “Monkey Island” was a working title, at one time.) I started imagining people behaving like the monkeys I’d been studying, and scenes and dialogue began to emerge. I began writing QUORUM in 1992, during the election campaign between George H.W. Bush and Bill Clinton. Campaign tactics, politicians’ behavior, and voter attitudes were an ongoing stream of inspiration and information as I was writing. And somewhere along the way, I bought a copy of Robert’s Rules of Order, and those essential rules for running a meeting found their way into the story. This play is a social/political satire, and looks at our world, which otherwise deserves a piercing gaze, with a light touch and humor. Lately, I’ve been thinking about the play as being a cross between Harold Pinter and Pogo. In other words, Pinter, a British playwright (the dark influence in my writing) meets Pogo, a comic strip I read when I was growing up, that brilliantly and fearlessly presented political and social satire with a lot of laughs! I began writing QUORUM 24 years ago, in a very different era of politics and American society. Or was it? The characters – what they say and what they do – seem painfully familiar when we look at the bullies and buffoons of our current, ongoing political campaigns. Are we still this bunch of slightly inept strangers? for tickets and show schedule, follow this link. 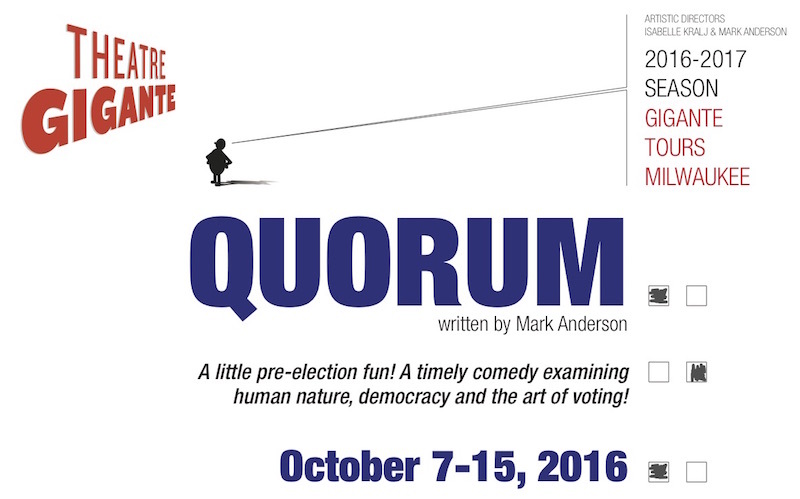 QUORUM, a play by Gigante Artistic co-Director Mark Anderson, opens October 7, at Plymouth Church, on Milwaukee’s East Side. A social/political satire, first produced in Milwaukee in 1993 by Theatre X, takes a look at democracy in the hands of the people. A bunch of strangers meet in a room, and attempt to form themselves into a group, which turns out to be not so easy. Votes are split 50/50, not everybody fully appreciates the responsibilities of being a member of the group, the whole thing seems to be run by bullies and buffoons…. As we surveyed the current political landscape, Theatre Gigante decided to dust off our copy of QUORUM and see if it is still relevant. It is. Perhaps even moreso than it was 23 years ago. Our new production features a cast of Gigante veterans: Leslie Fitzwater, Michael Stebbins, Bo Johnson, and Isabelle Kralj & Mark Anderson, plus some wonderful newcomers, Ron Scot Fry and Jocelyn Ridgely. The second stop on this season’s “Gigante Tours Milwaukee” series, QUORUM will be performed at Plymouth Church, 2717 E. Hampshire Street (two blocks East of UWM’s Mitchell Hall). It’s a very appropriate setting for a play about strangers meeting in a rented room, attempting to form a group.